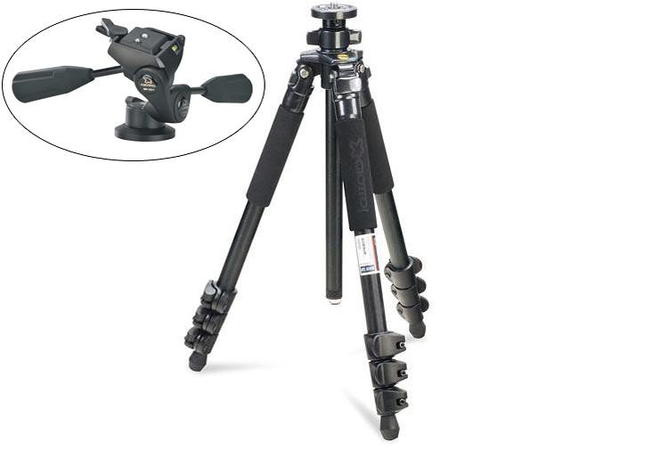 The Giottos MTL 9240B-5011SB Tripod is a compact class 4-section aluminum model paired together with a small 3-way pan/tilt head. It shares much of Giottos' feature set that is unique to their MTL class of aluminum models. With 22/19/16/13mm segments, the MTL 9240B-5011SB is made for use with consumer-class SLR cameras with short telephoto lenses, such as an 18-100mm type lens. There's not too much in the world of tripods that Giottos doesn't think to incorporate into their best models such as this MTL 9240B-5011SB. It has foam padded upper segments, a bubble level right at the neck of the unit as well as a 3-way level at the quick release assembly, flip-lock levers which can be attended to in the field if needed and an included tool kit which has a special short column attachment that allows an impressive minimum operating height. The MH 5011SB 3-way head has distinct locks for each axis of movement, with a 'snap-in' quick release system. All together, this tripod/head combination weighs just 3.23 pounds and collapses to just under 23" (58.2cm), so it can comfortably live on the outside of a backpack. Its working height is 50.9", so it isn't too much of a 'crouch-down' compromise in the world of travel tripods.